Soon after World War II, a vision was born by the Gypsies of Great Britain to create the perfect caravan horse; “a small Shire, with more feather, more color and a sweeter head” was the goal. Selective breeding continued virtually unknown to the outside world for over half a century until two Americans, Dennis and Cindy Thompson, while traveling through the English countryside, noticed a magical looking horse standing in a field. It was that very horse who became the key to unlocking the heretofore-unknown vision and genetics that created the Gypsies’ “vanner” breed (a horse suitable to pull a caravan). Be it good fortune, good luck or pure Gypsy magic, a passion was born in the Thompson’s to understand the little stallion that captured their attention and stole their hearts. It would take years of research – without the help of the Internet – to learn about this special horse and, just as importantly, the colorful culture, which had created it. • Identifying “Sonny Mays” and “The Coal Horse” – the two foundation stallions that inspired the Vanner breed – as well as much of the influential stock originating from those two. 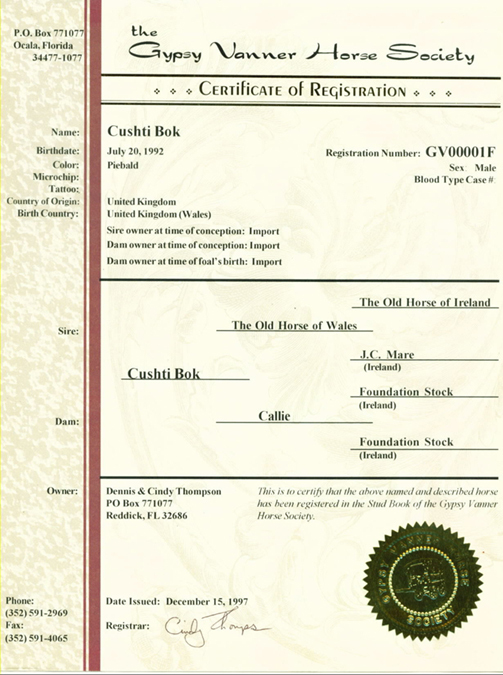 • Tracing the genetic heritage of “Cushti Bok” (the stallion they had discovered) through three countries. Discovering that, as a yearling, Cushti Bok had been “the most highly prized colt in all of Great Britain” at the same 300-year-old horse fair where their quest for knowledge began. • Naming the unnamed breed “Gypsy Vanner Horse”. Returning from our fateful trip, Cindy and I sat on a plane contemplating the absurd possibility that we may have just stumbled upon an unknown breed of horse in the last decade of the twentieth century. As wildly improbable as it seemed, consequent research confirmed that, in fact, one of the most magnificent breeds of horse the world has ever seen was not recognized, did not have a name and was not understood outside the world of Gypsies. I cannot explain or express deeply enough the sense of responsibility that reality brought with it.